This summer marks the launch of Transformers Titans Return, and personally I am really looking forward to it. The Titanmasters are a return of sorts to the Headmaster gimmick in G1. The smaller Titanmasters can interact with all the larger figures in a variety of ways. First off, you could swap out the heads to make the bodies into different characters. Second, the vehicle modes of larger figures can seat the smaller Titanmasters. The individually released Titanmasters even come with small transforming vehicles! Thirdly, the more large figures have a third city mode that serves as a playset for the little guys. I've always enjoyed a good playset and within Transformers, I've always enjoyed a good citybot. I have to admit, I'm really looking forward to collecting the smaller Titanmasters. 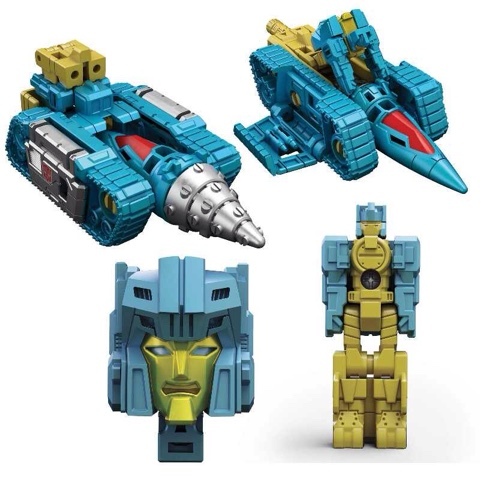 I'm hoping Takara does neat variations in wacky colors. I'm hoping for blind packed Titanmasters that I can hunt down trying to complete each series. I'm looking forward to the tiny vehicles at the little bots come with. Apeface, a Headmaster from G1, comes with a vehicle that emulates his original toys alt modes! I really like fun toy lines, as well as neat toys. Titans Return looks to be a solid and great line. I can't wait to get my hands on them.